[Stride]-Stride Step-[Choose one or more cards with the sum of their grades being 3 or greater from your hand, and discard them] Stride this card on your (VC) from face down. [ACT](G zone):[Counter Blast (2) & Choose a card from your hand, and discard it] If you have a grade 3 vanguard, the number of face up cards in your G zone is 0, your opponent's vanguard is grade 2, and no unit was placed on your opponent's (VC) during the ride phase of your opponent's preceding turn, Stride this card on your (VC) from face down. [CONT]:This card is from all clans and nations. This would have been pretty relevant and good...if G Guardians didn't already provide an incentive not to Grade stall. 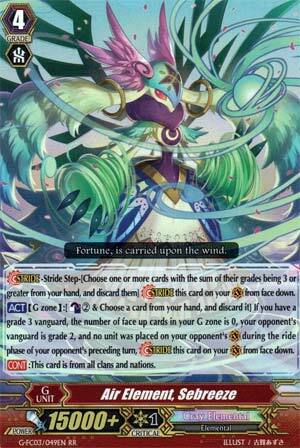 Which is what Sebreeze does: if the opponent sat on Grade 2 last turn and didn't Ride, if your Vanguard is Grade 3, and you have no other face-up G Units, CB2, discard a card from your hand, and Sebreeze will appear. Well, personally my own deck can survive without, but honestly, your deck will only want this if your deck is basically dependent on GB1 to function. Aside from that, I don't see it as being entirely worth it unless your deck has great resource management, because CB2 cost means some of your best skills are going to be limited at best. And as I mentioned earlier, G Guardians are pretty much incentive enough to not deliberately stall if your deck packs a good enough finisher, like a re-standing Vanguard or if you're Lambros. Only for decks who have sucky finishers or cannot reasonably rely on a first Stride to get the momentum they seek. I wonder if it's used for cleaning up stinky rooms. Anyway, what we have here is a staple going forward. If the opponent is at grade 2 and they didn't ride to Grade 3, or at all for that matter, for whatever reason the previous turn, whether it's because they missed a ride or because they're playing Ripple Rush, you can CB2 and pitch a card from your hand to Stride. HA! Screw you, rush down decks! Note that it doesn't work against those weird Spike Bros. rush decks where they drop in every Grade 1 they can to swing for massive numbers the first two turns. So, still a draw-back, but not one to worry about. Naturally, you only need one of these in your G-Deck. And, hey, if they ride like normal, you can always just use this for those units that flip any Stride unit face-up. Anyway, this one? Simple enough. Winston Fairwinds I can't help but smile when I see this card. Instead of ditching cards whose grades equal 3, you just ditch any card and counterblast 2 to Stride into Febreeze (might as well be its actual name) if your opponent is stuck at Grade 2, purposefully or otherwise. I'm gonna try to not get sidetracked with a whole discussion on how Febreeze gets rid of the toxicity of the Grade 2 game, or how Febreeze needs to exist to that Stride decks remain viable, and how Bushiroad's hand was forced to make this card. You can email me personally if you want that discussion. Bottom line is, you run him at a 1-of if you have a Generation Break boss as your grade 3. Do not be that person that takes the chance and assumes your opponent did not make room for Febreeze. They did. Febreeze does cost 2 counterblast, but any stride deck worth its salt has countercharge effects readily available to mitigate that cost.